This is just 4 of the "big ones" and Hillary Clinton, not unlike Barack Obama or Bernie Sanders, wants to champion all of these which would help lead us and the world to the 5th and final Progressive (communist) goal and that being global government, or in other parlance, a New World Order. * I would be remiss if I failed to mention two other issues of the Progressive's (communists), that are just as important for their NWO agenda and those would be the indoctrination and acceptance of homosexual rights beginning at childhood as well as abortion on demand through all 9 months of pregnancy. The reason for these two issues is that it leads to one more GIANT Progressive (communist) goal and that is POPULATION CONTROL. Yes, they want to SAVE THE PLANET of course. But save it from YOU. ....and 7 or 8 billion people are too many to try and control. -W.E. Professional Republicans in the #NeverTrump movement continue to oppose the presumptive nominee selected by the GOP electorate and are now floating strategies to throw the election to Hillary Clinton. However, an examination of Clinton’s campaign promises reveals that Republicans who are willing to thwart Trump in favor of Clinton will be complicit in electing a President who would seek to bring about the complete and, possibly irreversible, dissolution of our nation’s borders. A review of Clinton’s stated positions on the issue suggests she is perhaps the most extreme candidate on immigration ever to run for the office of the U.S. Presidency. Her views place her even further outside the mainstream of the American electorate than President Barack Obama, who systematically dismantled U.S. immigration law during his two terms in office. Below are just a few of the extreme immigration positions held by Clinton. Perhaps one of the most radical aspects Clinton’s open borders platform is that she is openly campaigning on defending and even expanding President Obama’s unconstitutional executive amnesties. “You can count on me to defend President Obama’s executive actions on DACA and DAPA when I am president,” Clinton said, referring to Obama’s 2012 (DACA) and 2014 (DAPA) executive amnesties, which gave work permits and access to federal benefits to millions of illegal immigrants. Clinton’s campaign website states that, as President, she will “defend President Obama’s executive actions to provide deportation relief for DREAMers and parents of Americans and lawful residents.” Meaning, Clinton will allow millions of illegal immigrants to remain in the United States, receive work permits to legally fill American jobs, and get access to federal benefits paid for by U.S. taxpayers. If Congress continues its refusal to act on comprehensive immigration reform, Hillary will put in place a simple, straightforward, accessible system for parents of DREAMers and others with a history of service and contribution to their communities to be able to make their case and be eligible for deferred action as well. While Clinton is pushing for immigration policies that would expand migration rates, polls show that the American electorate overwhelming wants immigration levels to be frozen or reduced—including 92% of the GOP electorate and 83% of the American electorate overall. Moreover, according to an October Rasmussen survey, most Americans still oppose Obama’s unconstitutional executive amnesty. A Kellyanne Conway poll found that by a 2-1 margin, voters believe that illegal immigrants should be encouraged to return home by shutting off their access to U.S. jobs and welfare. Clinton’s website has explained that by “comprehensive immigration reform,” Clinton means full citizenship for illegal immigrants, which would give them welfare access, voting privileges, and the ability to bring over their family members through chain migration. “As president, Hillary will fight for comprehensive immigration reform that provides a full and equal path to citizenship,” Clinton’s website states. Full amnesty for the illegal immigrant population will cost U.S. taxpayers $6.3 trillion, according to a report from the Heritage Foundation. Interestingly, Paul Ryan also won the early endorsement of Gutierrez prior to being elected as House Speaker. As Bretibart News has previously reported, Ryan’s views on foreign migration, foreign trade, and foreign wars are more similar to Hillary Clinton’s views than those of GOP presumptive nominee Donald Trump. Clinton has said that, as President, that she will essentially freeze deportations. “I would not deport children. I do not want to deport family members either,” Clinton declared in March. Clinton’s pledge not to enforce U.S. immigration law as President represents an essentially unprecedented departure from the nation’s history of enforcing immigration law. Clinton’s vision erases entirely the protections that U.S. immigration laws are supposed to afford American citizens: such as protecting Americans from losing a job to an illegal immigrant, preventing the sapping of school and hospital resources, as well as defending the voting privileges and enfranchisement of U.S. citizens (giving citizenship to illegal immigrants allows them to cancel out the votes of native-born American citizens). The implication of Clinton’s platform– i.e. that illegal entry is not in and of itself a deportable offense–represents a central pillar of the open borders credo: namely, that millions of people can illegally come to the country, take jobs, attend U.S. schools, receive affirmative action, apply for federal benefits, and give birth to children who receive birthright citizenship. Moreover, waiting until after a violent conviction has been obtained to deport an illegal alien means that immigration laws were enforced far too late–i.e. they were not enforced until after an American was victimized, raped, or murdered by a criminal alien. A federal policy that waits to enforce immigration laws until after there is a criminal conviction would mean admitting and releasing criminals by the hundreds of thousands, and letting them roam free until after they have committed a crime, and have been apprehended, tried, and convicted for that crime. 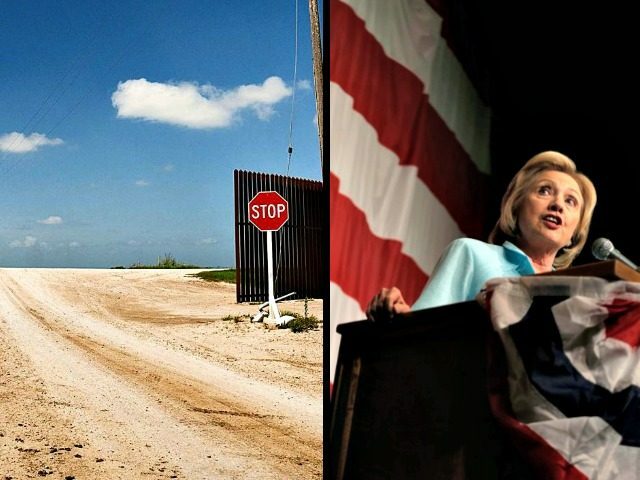 Even as tens of thousands of migrants continue to pour across our southern border, Clinton has declared that the border is “the most secure border we’ve ever had”– suggesting that she does not feel it is necessary to take additional actions to secure it. Clinton argues that since the border is already secure, it is time to give amnesty to the millions of migrants who have entered illegally. On her website, Clinton pledges to “end family detention and close private immigrant detention centers”. “Hillary believes we should end family detention for parents and children who arrive at our border in desperate situations. We have alternatives to detention for those who pose no flight or public safety risk, such as supervised release,” Clinton’s website explains. This again represents a radical step in further dismantling what little immigration enforcement is now in place. Clinton is essentially saying that she will not detain new incoming illegal immigrants, but will instead release them into the interior of the United States. Chelsea Clinton echoed this sentiment while campaigning for her mother. “It’s so important to extend the Affordable Care Act to people who are living and working here, regardless of immigration status, regardless of citizenship status,” Chelsea Clinton said in March. There are millions of people in America who could be naturalized, but for one reason or another, they’re not. So let’s help more of our neighbors claim their rights. It’s so powerful, so precious, to be a citizen of the United States! To be able to vote in our elections, to have a voice in our future, and I want to take down the barriers that are holding people back. So here’s a few things I will do: I will work to expand fee waivers, so more people seeking naturalization can get a break on the costs. I will increase access to language programs to help people boost their English proficiency. I will enhance outreach and education so more people know their options and are engaged in the process. I don’t want anyone who could be a citizen to miss out on that opportunity. Polling data suggests that Clinton’s voter importation plan will overwhelmingly benefit the Democratic Party. A 2011 Pew survey found that Hispanics have a more negative view of capitalism (55%) than do supporters of Occupy Wall Street (47%). A 2012 Pew Hispanic Center survey found that 75% of Hispanics prefer bigger governments that provide more services as opposed to smaller governments that provide fewer services. Hillary Clinton has called for a massive expansion in Middle East migration. Indeed, last year Clinton called for admitting 65,000 Syrian refugees—on top of the roughly 30,000 refugees and asylees the U.S. already admits from the Middle East each year. Adding in refugees from across the Muslim world, this means that under Clinton’s plan, the U.S. would admit at least 105,000 thousand refugees from the Muslim world annually. “I’ll work to ensure that every single refugee who seeks asylum in the United States has a fair chance to tell his or her story, this is the least we can offer people fleeing persecution and devastation,” Clinton said in December. Most remarkably, 85 percent of black voters oppose Clinton’s refugee agenda with less than one percent of black voters supporting her plan.